Fast-field echo-gradient rest-perfusion images (Figure 5) are remarkable for subendocardial hypoenhancement in the apical-inferior wall and mid- and basilar-inferior septum, inferior wall, and posterior lateral wall. Adenosine fast-field echo-gradient stress imaging (Figure 5) reveals similar decreased subendocardial perfusion, with exception to stress induced subendocardial hypoenhancement in the apical-anterior lateral wall, extending to the junction with the midchamber myocardium (Figure 5). 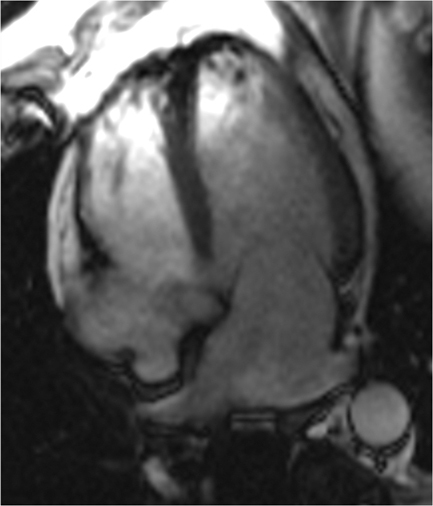 Inversion-recovery delayed short-axis images (Figure 6) are remarkable for apical-inferior wall (Figure 6) transmural (> 50%) delayed hyperenhancement (DHE), extending into the posterior-lateral wall, confirming the presence of myocardial scar and focal myocardial nonviability in the RCA territory. In the mid- and basilar-inferior septum, inferior wall, and posterior-lateral wall RCA territory (Figure 6), thin linear < 50% subendocardial DHE is demonstrated, consistent with subendocardial myocardial scar, but with viable myocardium. Of significance, images reveal absence of DHE in the apical-anterior lateral wall (Figure 6), confirming viability and corroborating the presence of stress-induced ischemia in the LCX/OM territory. 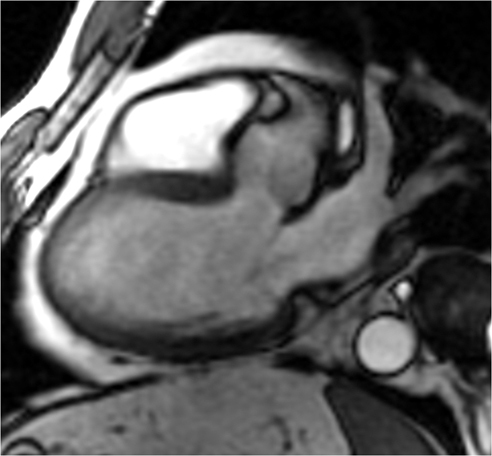 CMR myocardial perfusion and viability imaging has become a useful approach to evaluate coronary artery disease. When acquisitions are acquired using current stress and rest perfusion techniques, moderate to high sensitivity (84-100%) and specificity (80-100%) can be achieved for the detection of hemodynamically significant (> 70% stenosis) coronary artery lesions.1 As illustrated in Figures 1-6, accurate diagnoses can be made to determine the extent and location of myocardial scar and stress induced ischemia, in addition to evaluating cardiac morphology and function. Regions of scar are further characterized as having residual viable myocardium (eg, < 50% of myocardium) or having no viable myocardium (eg, > 50% of myocardium), by determining the burden of scar relative to the myocardium. 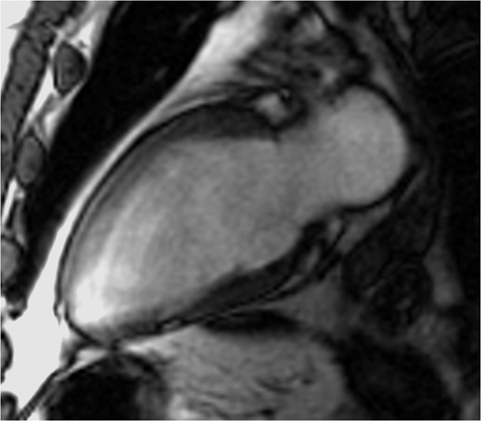 In patients with known ischemic cardiomyopathy and myocardial scar, CMR stress-rest perfusion and viability imaging can be used to predict future risk for adverse cardiovascular events.2 In this regard, CMR imaging can be utilized to plan effective therapy for minimizing cardiovascular morbidity and mortality, including medical management, percutaneous coronary intervention (PCI), and coronary artery bypass grafting. 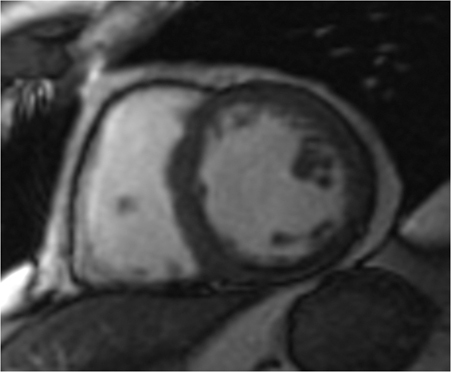 In summary, this patient’s perfusion-viability CMR imaging demonstrates a small focal area of apical-inferior wall transmural, > 50% myocardial DHE with corresponding akinesis and fixed-perfusion rest-stress defects, corresponding to RCA territory scar with nonviable myocardium, related to the patient’s prior MI. In the mid- and basilar-inferior septum, inferior wall, and posterior-lateral wall, < 50% subendocardial DHE with corresponding mild hypokinesis and fixed-perfusion rest-stress defects, corresponds to RCA scar, but viable myocardium, related to the prior MI. At the apex, with extension to the junction with the midchamber myocardium, stress-induced ischemia in the LCX/OM territory corresponds to hemodynamically significant CAD. As residual nonhemodynamically significant LCX/OM disease was known from the patient’s prior coronary catheterization, CMR imaging suggests progression of disease and supports the need for maximizing CAD medical management and possible coronary catheterization with PCI. The patient ultimately underwent coronary catheterization, which confirmed obstructive LCX disease with no significant change in the OM1 lesion. PCI-LCX stent placement was performed with subsequent improved left ventricular global function on a post-PCI echocardiography. Coelho-Filho OR, Rickers C, Kwong RY, Jerosch-Herold M. MR myocardial perfusion imaging. Radiology. 2013; 266:701-715. Tsukiji M, Nguyen P, Narayan G, et al. Peri-infarct ischemia determined by cardiovascular magnetic resonance evaluation of myocardial viability and stress perfusion predicts future cardiovascular events in patients with severe ischemic cardiomyopathy. J Cardiovasc Magn Reson. 2006;8:773-779. 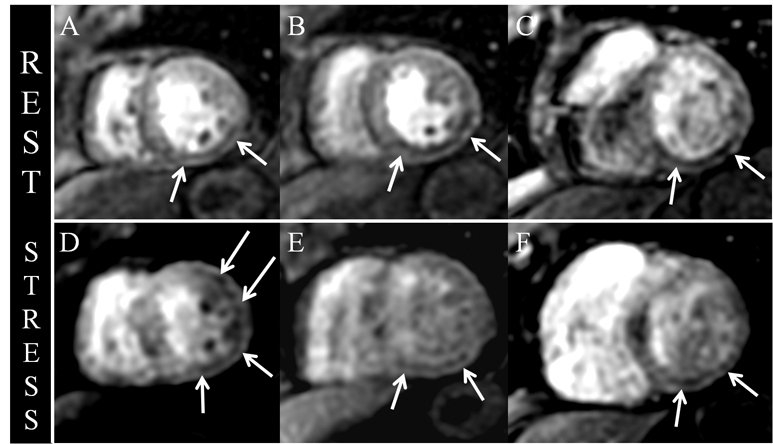 Cardiac MRI perfusion and viability imaging: Clinical value in cardiac care. Appl Radiol.